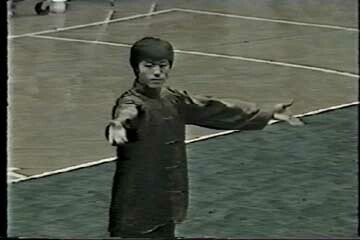 [A intro that goes into some of the history of the founding of the Beijing Wushu Team. I translated (and somewhat edited) this from what's found on www.sinowushu.com, represented here w/ consent]. 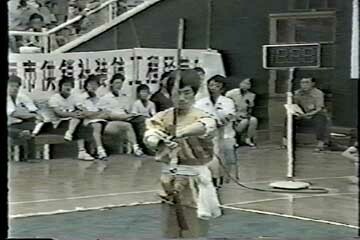 The Beijing Team was founded in November 1974 as a successor to the Beijing Wushu School. The Beijing Wushu School was created in order to prepare the city of Beijing for the First All China Games, Beijing Sports University (now Beijing Physical Education University) wushu department graduate Liu Peiwei was appointed team leader and coach. After the first All China Games, the Beijing found a home at the Beihai Sports Center, with Liu Peiwei serving as the first director. In 1963 Beijing Sports University graduate Wu Bin came to the school as a coach bringing new vitality into the sports school and establishing the foundation for the Beijing Team's later success. In 1964, after poor results at the National competition, Wu Bin, Wang Jinsheng and the other coaches set out a plan to create a gold medal team. Their plan was to start from a young age, select promising athletes and follow a rigid, comprehensive, scientific system of coaching. Within a year, through much hard work and effort by Wu Bin, at a citywide competition, his athletes won second in the women's empty hand, short and long weapons. During the Cultural Revolution, the athletes continued to train. In 1970 they were approved to establish the amateur wushu office. By this time Wu Bin was already appointed to the Wushu research society and Beijing City Wushu Association. Wu Bin utilized the resources of Beijing's traditional martial arts masters as well as the wealth of skill from across china in his coaching, increasing his athlete's wushu level. In November of 1972, at the National Wushu competition, 12 athletes from Beijing attended, and nine won championships (out of a total 0f 13). Because of their hard work and achievements and with the strong support of Beijing Sports Director Wei Ming, the amateur sports school's reputation grew daily and the level of the athletes improved further. In November of 1974 the Beijing Wushu Team was founded and quickly dominated the National competitions, undoubtedly due to Wu Bin's diligence and hard work. There were originally 28 people in the team: 3 coaches, Wu Bin, Cheng Huikun and Li Jinfeng. 25 athletes, 12 men and 13 women: The men's team included Li Lianjie (Jet Li), Li Zhizhou, Wang Jianjun, Li Jinheng, Yu Shaowen, Wang Qun, Yan Ping, Dong Honglin, Sun Jianming, Tang Laiwei, Cui Yahui and Yang Yongli. The women's team included Li Xia, Hao Zhihua, Ge Chunyan, Zhang Hongmei, Luu Yan, Hui Xuna, Huang Qiuyan, Zhou Jingping, Zhang Guifeng, Mi Jin, Wang Xiuping, Huang Xiaofeng and Zhang Dehua. Since then team members and coaches have changed and the team has evolved. Many retired athletes have continued on as coaches helping foster the next generation of athletes. In the nearly three decades since, through the hard work of the athletes and coaches, the level of success has reached great levels. From 1974 to 1997, they won the National team championship 11 times. Finishing in the top 6 places 526 times: of those, 147 were golds, 108 silver and 96 bronze and bringing honor to the city of Beijing. In 1983 the Beijing Wushu Team had 47 top six finishes, 15 golds, 7 silvers and 8 bronzes). Li Zhizhou and Hao Zhihua won outstanding men and women's awards and the team won the outstanding team award. For their achievements the city government of Beijing awarded the team a banner reading "Yong pan gaofeng, wei guo zhenguang" [Reaching great heights, winning honor the nation]. Every year the Beijing time performs many demonstrations of wushu for the citizens of Beijing as well as visiting dignitaries. They have performed for President Carter as well as many other foreign heads of state when they visit Beijing. The team has also helped promote wushu throughout the world. Visiting Japan, the US, Great Britain, Spain, Ireland, Thailand, Syria, the Phillipines, Burma, and Australia. As part of the Chinese Wushu Team, Beijing athletes have gone to Italy, Malaysia, Egypt, Turkey, Moroco, France, Mexico, Vietnam, Algeria and Tunisia. Over the years the Beijing team has made many international relationships. The Beijing team members are first and foremost athletes and coaches, but they also work with movie producers to make films. Aside from Jet Li, many other athletes have also been featured in movies. for example Wang Jue have starred in "Shaolin Temple", "Shaolin Kids", "North and South Shaolin" to name a few. Wang Qun was in "Zhen San," "Treasure beyond the Great Wall" and "Beggar Spirit." Coach Li Junfeng has appeared in "Wulin Zhi", "Broadsword King 5" amongst others. Zhang Hong Mei was in "Xia Nuu Chu Bao" and "Xia Nuu 13 Mei." Li Jinheng was in "11 Gold Medals."